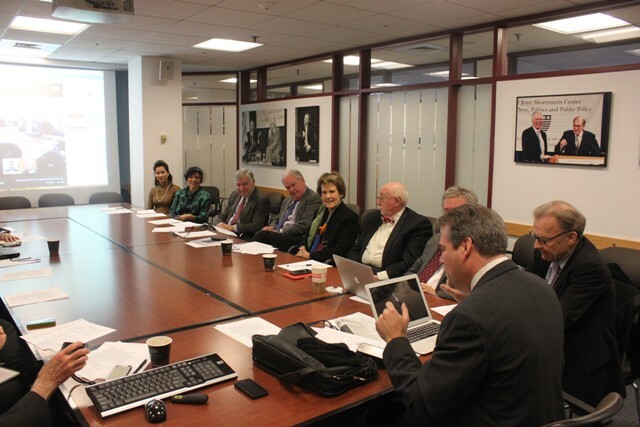 (Cambridge, MA, December 12, 2014) – Boston Global Forum (BGF) today announced its Framework for Peace to solve conflicts in the Pacific in an international meeting with a panel of distinguished international relations authorities and academic leaders at Shorenstein Center of Harvard Kennedy School. The event also marked the organization’s two-year birthday anniversary. 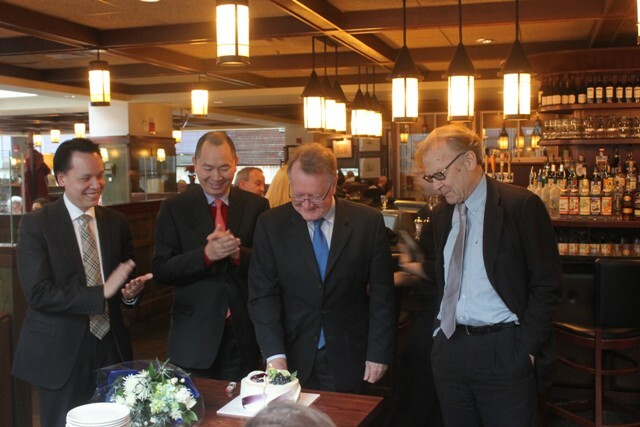 Photo: Professor Thomas Patterson, Professor John Quelch, BGF Editor-in-Chief Nguyen Anh Tuan, and Mr Duong Cuong Anh congratulated the BGF’s birthday. Former Gov. Michael Dukakis, co-founder & chairman of the Boston Global Forum think tank moderated the discussion whose goal is to prevent armed conflict among the US, China, Japan, Vietnam and other Pacific nations with its Framework for Peace. The Framework is the culmination of a nearly yearlong series of international meetings that began in April this year with delegates from Cambridge, Washington, DC, Tokyo, and Hanoi including Prof. Joseph Nye, Prof. Thomas E. Patterson; Prof. Erza Vogel; the Hon. Kevin Rudd;President of the Club of Madrid Dr. Vaira Vike-Freiberga; Nguyen Anh Tuan; Deputy Assistant Secretary of State Michael Fuchs; Ambassador Ichiro Fujisaki; Amb.Seiichi Kondo; Prof. Dairokuno Kosaku; Prof. Koichi Hamada; Robert D. Kaplan; Thomas Vallely; Professor Richard Rosecrance; Dr. Patrick M. Cronin; Bonnie S. Glaser; Professor Etel Solingen; Professor John Quelch; Ambassador J.D. Bindenagel; Ambassador Stephen W. Bosworth; Ambassador Swanee Hunt; Professor Suzanne P. Ogden; David E. Sanger; David Case; Professor Jonathan London; Professor Richard Cooper ; Professor Barry Nolan; Llewellyn King; Charles M. Sennott; Dr. Anders Corr; Richard Pirozzolo; Dr. Elliot Salloway and several supporters. Introduces viable action steps to promote peace and security in the Pacific. As part of the Framework, Boston Global Forum also announced establishment of the Young Leaders Network for Peace and Security (YLNP). YLNP is a body of exceptionally promising young leaders in politics, media, business, and academia who are under age 40 and have already demonstrated an interest in the causes of peace and security, and an ability to shape a more secure future. The YLNP is a part of the Forum’s charter calling for turning the Framework for Peace into a reality. The BGF also introduced Global Threats Index (GTI) and the Michael Dukakis Leadership Fellow Program. The Global Threats Index (GTI) aims to provide a snapshot of how the BGF’s panel of experts assess the latest developments in areas that may present critical threats to global peace and stability. The index will be produced monthly under the direction and supervision of Prof. Tom Patterson, the Co-founder, member of the BGF Board of Directors, and Bradlee Professor of Government and the Press at Harvard Kennedy School. 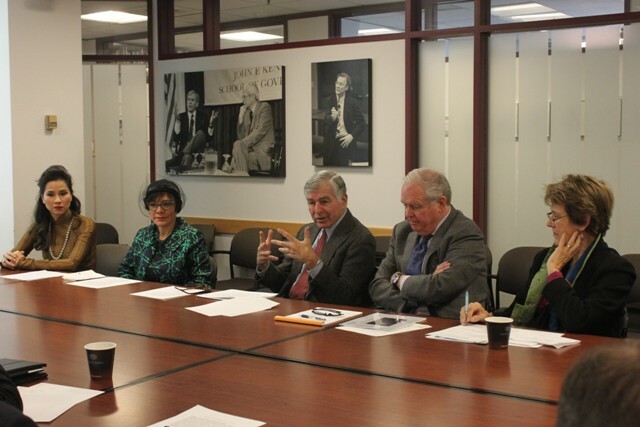 While the Michael Dukakis Leadership Fellow Program (MDL) is launched to promotes innovative actions aiming for peace and security to make the world safer and better by providing fellowships for on-the-job training to individuals. 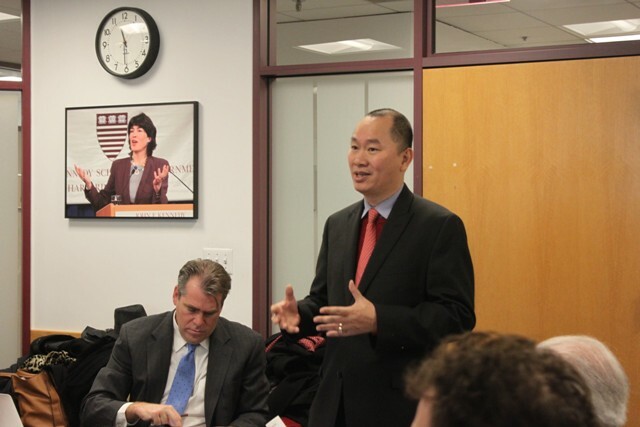 The MDL is initiated and fully funded by the Boston Global Forum. The conference featured appearance of Ms. Nguyen Thi Chau Giang, the concert pianist and painter and Ms. Maribel Lieberman, the founder and Chief Executive Officer of MarieBelle New York Chocolates which is one of the Oprah Winfrey’s “Favorite Things”; and Mr Mau Tuan Le, the founder and CEO of Zenquiz.net, and a MIT PhD candidate. They all presented as the Young Leaders for Peace.